Bosnia and the "heritage of Dayton"
On 11 July 1995 the Serb-Bosnian troops led by general Ratko Mladic entered Srebrenica, a town in the eastern part of Bosnia-Herzegovina that had been declared UN safety zone. Despite the presence of a contingent of Dutch blue helmets, Mladic' soldiers carried out the most harrowing massacre in Europe since the end of WW2: after splitting the Muslim population into males and females, they killed all men, boys and elders of the town. The victims of what would then be called as genocide were 8372. Besides the actual executioners, international justice also found the Netherlands guilty of genocide in Srebrenica. In 2014, in fact, the District Court of The Hague recognised the country as civilly responsible for the death of at least 300 of the 5,000 Muslim Bosnians who had been taken away from the compound of the Dutch blue helmets in Potocari, and actually handed over to the Serbian militias. In the past few days, furthermore, the British Sunday paper The Observer published an inquiry, based on declassified papers, to report major responsibilities of the US, France and the United Nations - who in name of realpolitik, that is to say an agreement with Serbia, ignored the overt intention of Mladic to "make totally disappear" the Muslim population of the area. 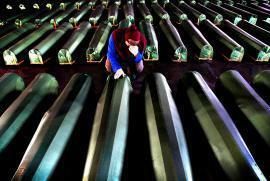 Twenty years after the tragedy, the massacre of Srebrenica still divided the countries of the region. Currently they clash on a resolution draft that was presented in four different versions from Great Britain to the UN Security Council precisely on the anniversary. The British text meant to recognise the one in Srebrenica as a true genocide case, as established by the International Criminal Court for the former Yugoslavia in 2004 - with Krsitic verdict, and by the ICC in 2007. The Serbian and Serb-Bosnian politicians opposed such a resolution, which would officially recognise the Serb responsibilities in the massacre. The Serbian President Tomislav Nikolic and his Minister of Foreign Affairsi Ivica Dacic asked Russia to exert its veto power within the Security Council; a similar proposal was put forward by the President of the Republika Srpska - the Serbian entity of Bosnia-Herzegovina - Milorad Dodik. More quiet was the stance of Serbian Prime Minister Aleksandr Vucic, who will take part in the official commemorations of 11 July despite his firm opposition to defining genocide what happened in 1995. The vote on such document was initially postponed by the US and Great Britain, who meant to avoid a clash with Russia; nonetheless Moscow has accepted the Serbian demands and vetoed the resolution draft. This debate comes at a very delicate moment, in which the relations between Serbia and Bosnia-Herzegovina - already very complex - have been damaged by the events connected to the arrest of Naser Oric, former general of the Bosnian Muslim forces of Srebrenica, detained for some weeks in Switzerland upon warrant issued by Belgrade. Serbia accused Oric of attacking some villages near Srebrenica between 1992 and 1995, with the intention of ousting the Serbian civilians from their homes: the man nonetheless had already been acquitted by the International Tribunal for the count of war crimes. Currently, Swiss authorities have accepted the Bosnian extradition request, and not the Serbian one. Weighing on the difficult relations between the Muslim and the Serb-Bosnian community is also the European theme: while the former are in favour of demanding adhesion to the Union, the Srpska Republic would aim at secession and getting closer to Moscow. In all this weighs the “heritage of Dayton”, i.e. of the peace accords that in 1995 put an end to the Balcan conflict. With such deals, Bosnia crystallised its own ethnic cleavages, with the division into two main entities, the Croatian-Muslim Federation and the Republika Srpska. At the political level, furthermore, today in Bosnia a Croatian Catholic, a Serbian Orthodox and a Bosnian Muslim President are elected. Whoever does not fit into these three groups is marginalized.